This one's been sitting in my liquor cabinet for awhile now, waiting to be reviewed. After a little hiatus due to all the craziness that life throws at a person, I'm back! This is a review of The Real McCoy 5 Year Old Rum. For whatever reason, most of the rum I drink tends to be spiced. So, it's nice to mix things up a bit and get to review an unspiced rum. 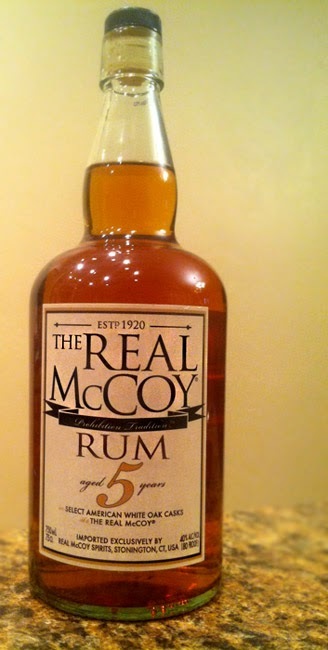 The Real McCoy Rum 5 Year Old is produced at the Foursquare Distillery in Barbados. Many people have heard of the term "the real McCoy," meaning something that's the real thing, not a fake. But most don't know that term comes from Bill McCoy, a rum runner back in the 1920's during Prohibition. Ol' Bill would run illegal, but real, Caribbean rum up to New York, thus coining the term The Real McCoy. This rum, 5 Year Old The Real McCoy, is produced in that Prohibition-era tradition. It's aged in American White Oak Casks for five years and comes in at the standard 80 Proof. I really like the oldschool scotch-style bottle and the faux-cork stopper, both nice to see. The Real McCoy is surprisingly subtle on the nose, with mildly sweet aromas of molasses and light caramel, vanilla bean, and a slight undercurrent of oak. Tasting brings a smooth mouthful that's primarily oak and vanilla, with a hint of dry spiciness, and a mild butterscotch kick in the finish. All in all, a very solid rum. The Real McCoy is sweeter on the nose than the palate, but easily drinkable neat or on the rocks since it's so smooth and subtly nuanced. You could mix it with cola, but I'm afraid the cola would overwhelm the mild flavors here. Unless that's how you roll... then hey, do whatever you want! Drink This: if you want a smooth, mild rum.